I am sure this will sound like a high school report but am sure not too many people are aware of these facts, even Boholanos. I got these from the official website of the Province of Bohol and I would assume reliable, except of course that some of the data are not quite up-to-date. 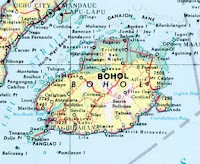 Bohol is located at 803 km. south of Manila and 79 km. southeast of Cebu. It is part Region VII or the Central Visayas Region. Its capital is Tagbilaran City, its lone city. It has 47 municipalities and 1,109 barangays. The province has a population of 1,139,130 (as of 2000) occupying a land area of 4,117.26 sq. kilometers. Its population speak a Boholano variant of the Cebuano language and most, with 93 percent literacy rate, can understand English and Tagalog. The province has an estimated labor force of 404,000 (as of 1996). The province’s climate is generally fair with average temperature at 29 degrees Celsius. It has estimated 256,400 hectares of arable land. Based on Department of Trade and Industry (DTI) registrations as of 1998, the province has 762 manufacturing establishments, 2,345 services, 5,925 wholesale and retail. These establishments include companies engaged in limestone mining, galvanized iron sheets, soft drink bottling, food processing, among others. Exports include prawns, baskets and woven raffia. Agricultural and aquatic products include rice, corn, coconut, root crops, vegetables, fruits, poultry, fish, prawns, crabs and seaweeds. Of its land area, 310,455 hectares are classified as alienable and disposable while 101,271 are considered forest land. Power supply in the province is at 93.5 MW while water supply in Tagbilaran City is estimated at 19,000 cubic meters daily. The road network in the province is estimated to reach a distance of 5,385 kilometers. Entry points include one domestic airport in Tagbilaran City, sea ports in the City and in Tubigon, Jagna, Ubay, and Talibon, and sub-ports in Catagbacan and Getafe. There are also 15 municipal fish ports and 2 private ports. There are around 30 taxicabs in addition to 1,010 bus companies and 4,716 vehicles for hire operating in the province. There are an estimated 12,200 telephone lines with 6 telecommunications companies and 2 cellular phone firms operating. There are 5 radio stations, 5 television/cable stations, 3 local newspapers, 20 commercial banks, 21 development banks, 2 government banks, 1 cooperative bank, 2 savings bank, 7 rural banks, and round 7 automatic teller machine (ATM) facilities operating.